A tracheotomy is a surgical opening through the neck into the throat. The opening is called a stoma or tracheostomy. It may be temporary or permanent. A tube called a tracheotomy tube will be inserted into the tracheotomy. Air may pass directly through this tube or tubing will be attached to a machine that assists in breathing. A tracheotomy may also be done if long-term mechanical ventilation is needed. A tracheotomy allows for greater movement, the ability to eat and drink by mouth, and the ability to speak while receiving ventilation. It can also prevent aspiration of food and liquids into the lungs. A cut will be made in the skin of the neck. A section at the front of the windpipe will be removed. A tracheostomy tube will then be fitted into this opening in the windpipe. Depending on the situation, an inflatable cuff may be part of the tube. The cuff is most important when the tube is being used for mechanical ventilation, to keep air going into the lungs and not leaking into the mouth. The skin will be closed with stitches or clips. The tracheostomy tube will be used for breathing as long as it is in place. The hospital staff will make sure the tracheostomy tube is working properly. In some cases, a chest x-ray can be used to evaluate the tracheostomy tube. Tracheostomy tubes need to be cared for on a regular basis. The hospital staff will teach you how to care for your child’s tracheostomy tube. It is important follow the staff’s instructions to prevent infection and airway obstruction. Other specialists will help your child adjust to the tracheotomy and learn how to speak and eat with the tracheostomy. About the procedure. Johns Hopkins Medicine website. Available at: https://www.hopkinsmedicine.org/tracheostomy/about/index.html. Accessed January 11, 2019. Deutsch ES. Tracheostomy: pediatric considerations. Respir Care. 2010;55(8):1082-1090. Frequently asked questions (FAQ) about tracheotomy and swallowing. American Speech-Language-Hearing Association website. 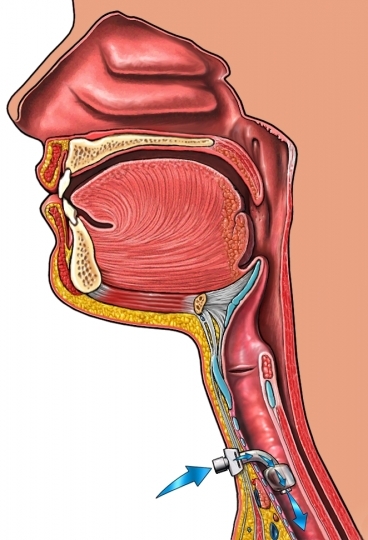 Available at: http://www.asha.org/slp/clinical/frequently-asked-questions-on-tracheotomy-and-swallowing. Accessed January 11, 2019.